GRADE LEVEL: various ages 7-17. 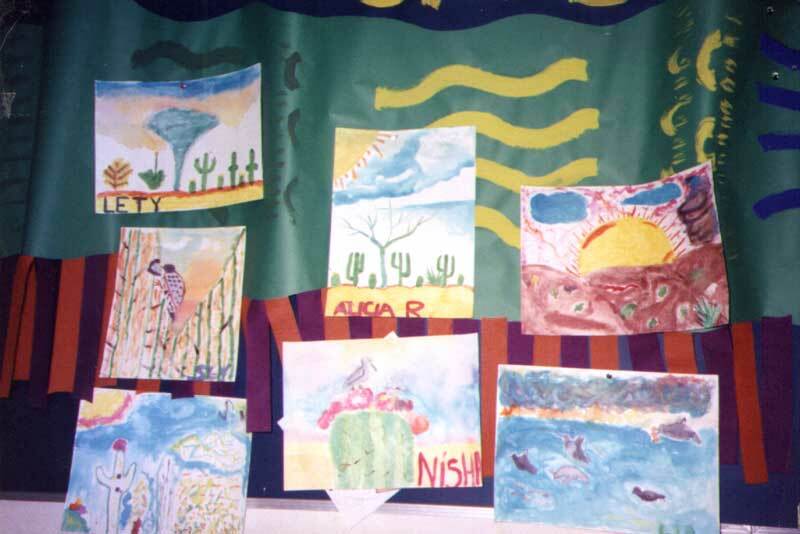 LESSON DESCRIPTION: This ten hour lesson (five days) combines literature, the visual and musical arts to introduce students to the interconnectedness of all life (plant, animal and human) on this planet. Students work with paper cut-outs and water color technique. There is a field trip to the local botanical garden. These same participants may write prose or poetry to express verbally what they have learned. Music is continuously playing, related to the earth (auditory stimulant). Participants learn that Winslow Homer used nature scenes as the subject of many of his watercolors. Youth learn that Henri Matisse used cut paper as an art medium. Participants read literature by Henry David Thoreau, Illustrated by Winslow Homer. Participants learn that Contemporary Children's literature can illustrate the beauty of nature and its interconnectedness. Diverse instrumental music is played to convey the ability of music to project the sounds and rhythms of nature. 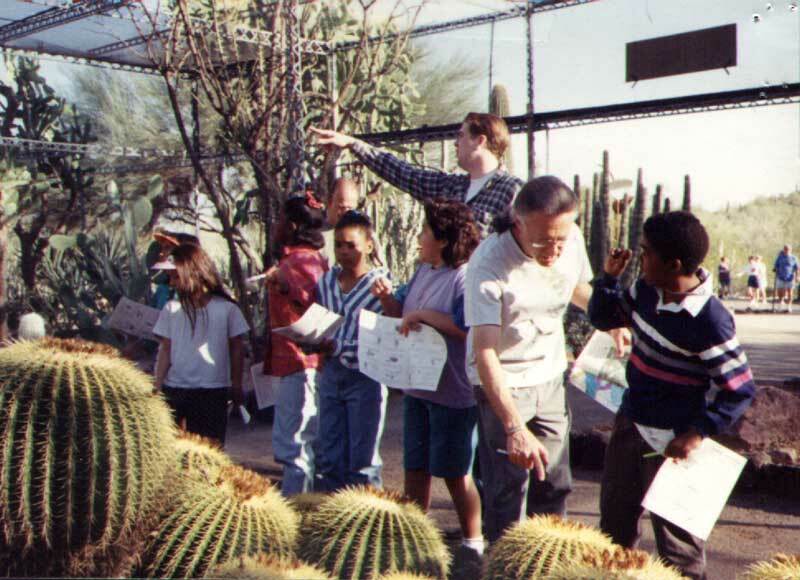 Members learn that a field trip to the botanical garden can provide the visual input to heighten sensitivities to the natural designs and beauty in the desert. Students learn how to use watercolor techniques to illustrate an idea (respect for nature). Students learn how to work with others to express an idea (interconnectedness of life) using paper cut-out techniques. Participants may choose to express in writing what they have learned. ARTWORKS REFERENCED - Winslow Homer, Henry Matisse and Henry David Thoreau. Musical compositions of your choosing. COMMUNITY RESOURCE - "The Phoenix Botanical Garden, Utilizing the :Desert Detective"
Children's literature is read in the communal "Circle of Power" - passing the book around the circle of readers as each participant takes a turn reading and sharing their input on the information and illustrations shown on that page. The teacher takes on the role of facilitator rather than absolute director of the process responding to comments of children and their newly acquired knowledge. This story provides a rich context for teaching several environmental education concepts. One or several of these concepts may be the focus of the lesson, reflecting the developmental level of the audience. An art making activity follows. Because there are no page numbers in this text, the first page with words has been identified as page one. 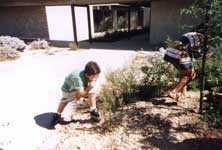 Noted pages have recorded suggested environmental education questions to discuss. What do you notice about Alejandro's environment? Why would someone stop by to refresh oneself? Why would this occasional visitor cause Alejandro to be lonelier after he/she left? Why would planting a garden make the lonely hours more endurable? Who or what might the desert visitor be? Can anyone creep like a ground squirrel? Why did the squirrel come to the garden? 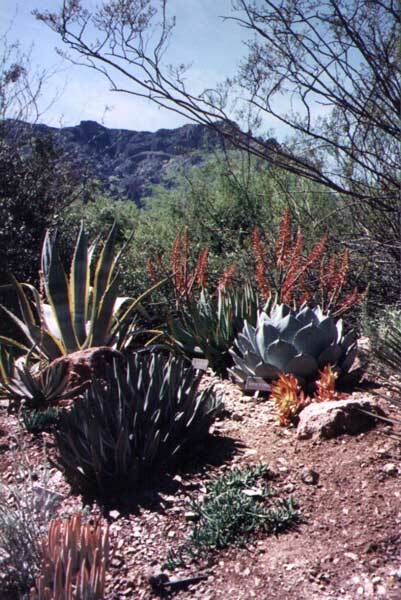 Compare and contrast the desert and the garden environments. What was the realization that came to Alejandro? Describe the different animals at the watering hole. Use the animal reference in the back of the book for names, descriptions. Talk about the food chain that one might see in the garden at the beginning of the story. Discuss the natural cycle of life. What did the skunk's quick departure illustrate to Alejandro? 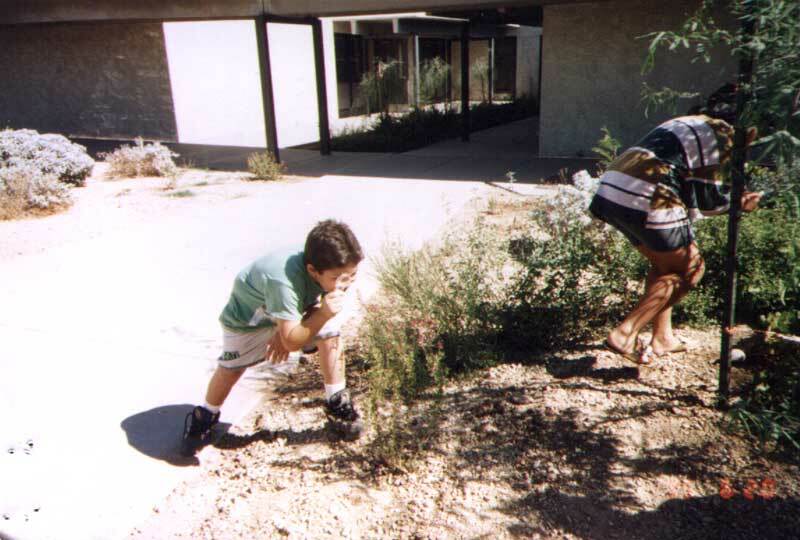 Why did Alejandro put his second watering hole in the safety of heavy desert brush? Even though Alejandro had worked hard to provide a watering hole for the animals, why did he feel he was the one who received the gift? Look back through the story and focus on the illustrations. Discuss the colors used, the medium, the expression of the animals and how the viewer felt reading the story. Illustrate for the student watercolor technique at this point. Allow the participants to practice using a crayola basic color palette and a larger brush that is not in the purchased container. Make sure the student waters down the watercolor paper lightly before beginning and proceeds slowly, not smashing the brush hairs down onto the paper. Show how one uses the tip and side of the brush and glides it over the surface building up layers of color, but not working too long in one area. Brother Eagle, Sister Sky, paintings by Susan Jeffers, Chief Seattle's speech to the calvary . Antelope Woman, paintings by Michael LaCapa, Apache, An Apache myth. Alejandros' Gift, by Richard E. Albert, Illustrated by Sylvia Long, story set in the Arizona desert. Old Turtle, text by Douglas Wood, Watercolors by Cheng-Khee Chee. A creation myth. Meet Matisse by Neilly Munthe, Little Brown and Company, 1983. A child's reference book. The World of Winslow Homer, Flexner, Time-Life Library of Art, 1966. In the Spirit of Mother Earth-Nature in Native American Art, created and produced by McQuiston & McQuiston, Chronicle Books, 1994. The Cut-Outs of Henri Mattise by John Elderfield, George Brother, Inc. 1978. Matisse, John Jacobs, Henry Adams, Inc.